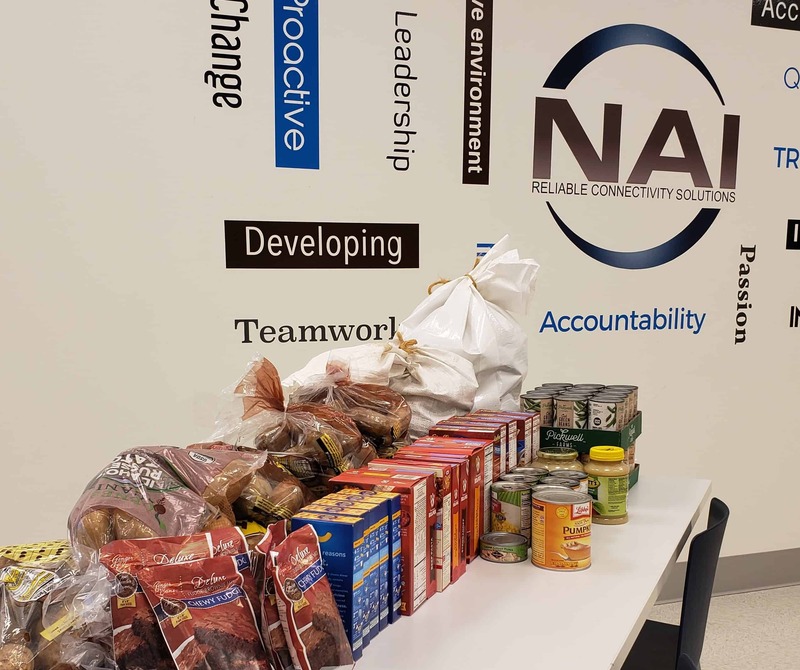 Troy, MI – NAI, a leading manufacturer of end-to-end connectivity solutions for high performance systems in industrial, telecom, data and medical industries, has announced the start of their Thanksgiving Food Drive to run November 12 through November 16. NAI is seeking help from the local community to donate food items to families in need. NAI will accept the following food items at their facility in Gaylord, MI, located at 1258 Old 27 North. While they prefer drop-offs between the hours of 12:30 pm and 1:30 pm, they can accept donations at any time between 8:00 am and 4:30 pm. NAI is also accepting monetary donations (cash, check or money orders payable to NAI) to purchase turkeys or hams, which will be picked up by family recipients at the local Save-A-Lot store. At this date, NAI has identified 70 local families in need of food baskets, which will be assembled and delivered by NAI employees on Monday, November 19. NAI hopes to meet this goal with the help of its local neighbors, friends and community members. NAI provided sign-up forms to the Dept. of Health and Human Services, where local community members could fill them out to apply for a Thanksgiving Food Drive basket. For more information on the Food Drive, please contact Jamie Belanger at 248-817-4106, ext. 3297. For more information about NAI, please visit the NAI website at www.nai-group.com. NAI manufactures assemblies across diverse markets including fiber optics, telecom, industrial, and medical industries. The company’s unique ability to service both high mix / low volume and low mix / high volume programs, while complying with complex regulatory requirements, supports the unique business needs of all customers, delivering the confidence and reliability that enable their success.